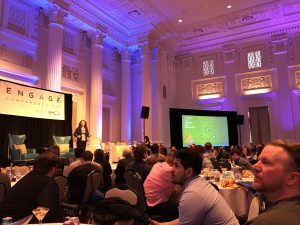 I had the pleasure of attending the first annual Engage Conference (formerly SearchFest) in Portland, Oregon a few days ago and wanted to share an overview of the day as well as the insights and takeaways from the great lineup of speakers. It all started with the most important aspect of the day: breakfast! 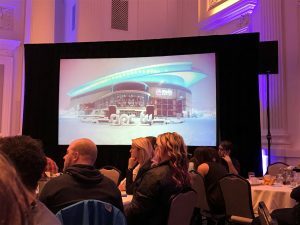 7:45 AM – I walked into the Sentinel Hotel’s Governor Ballroom which was already teeming with conference attendees who were avidly participating in animated conversation as they feasted on an amazing breakfast. I piled my plate with roasted potatoes, yogurt, oatmeal, fresh fruit and, most importantly, bacon! Once I gathered my food, I snagged a cup of Stumptown Coffee and located the table the rest of my team was sitting at and proceed to dig in. While we were eating we took the time to review the different speaking tracks which included Social and Content, Brand and Experience, Local and Mobile, and Search as we wanted to make sure that we were able to take in as many presentations as possible inside of our unique disciplines. 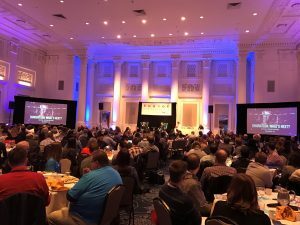 8:30 AM – As we finished our breakfast, and guzzled the amazing Stumptown Coffee from extremely tiny cups, Matthew Gardner, Customer Experience Manager of the Portland Trail Blazers, took the stage as the morning keynote speaker to get the ball rolling. He talked about how the Trail Blazers digital marketing efforts have shifted over the years and how he works with team members across digital analytics and creative services to deliver a highly “innovative, fan-forward online experience” that has culminated in his department winning back to back NBA Digital Innovation Awards. It was an outstanding presentation that highlighted the need for measurement of marketing efforts as well as the creation of unique, fan-engaging content to create the “Rip City” experience. 9:30 AM – Once the morning keynote had wrapped up, the team and I parted ways so we could move to the different presentations we would be attending. I chose “Everything You Need To Know About App Indexing, Mobile-First, and Technical SEO in 2017” with Rob Ousbey of Distilled and Emily Grossman of MobileMoxie which covered questions related to mobile search, app optimization, voice search, and more. This was a “Fireside Chat Discussion” format and the audience was able to ask questions around the topics of the track with Rob and Emily providing their insights on what mobile-first indexing actually means and what its impact will be, how ranking factors change or shift for voice search, and what marketers really need to know about AI assistants and chatbots. The conversations were good, but due to the informality of the session, I feel that the primary topics were not covered as effectively as they could have been. However, if there was a new takeaway, it was the focus on PWA’s (Progressive Web Apps) which I had heard of in passing but was a focus for both Emily and the moderator, Cindy Krum, as they both felt that PWAs will be a large part of the future of digital marketing. 11:00 AM – After refreshing the tiny cup of coffee and grabbing a pastry (or two), I sat in on the session Voice and Assistant: The Bleeding Edge of Search, which provided the attendees the opportunity to hear from two industry experts, Purna Virgi of Microsoft and Dr. Pete Meyers of Moz. Purna kicked things off with an outstanding presentation titled: Your Step-By-Step Guide to Testing Voice Search. Her presentation provided a 5-Step Process on how to identify long-tail keyword phrases that should be targeted for content development and optimization for Voice Search. Next, Dr. Pete provided his insights around the future of voice search in his presentation, From Desktop to Home: Optimizing for Voice. Dr. Pete touched briefly on what Purna had discussed around identifying long-tail phrases that should be optimized for and then talked about how to “Write for Answers” which focuses on developing content to answer the long-tail questions that will return the answers in the “Knowledge Card” section of the search engine results. There is a lot of strategy on how to approach this that uses the step by step process that Purna provided to determine the What, How and Why questions that content should be developed around so your website can rank in the Knowledge Card area which will be the focus of a later blog post. Stay tuned! 12:15 PM – Lunch Break! SEMpdx, the group responsible for putting on the Engage Conference, really put together a great spread of food for the entire conference with the menu for lunch including prosciutto-wrapped chicken breast, cheese tortellini, salmon, salad, breadsticks, and more! 1:15 PM – The afternoon sessions kicked off and I chose “Perfect Pages: Content That Ranks and Satisfies” with David Portney of 3Q Digital and Cyrus Shepard of Fazillion. David provided a very thorough walk-through of his approach to keyword research which, even though keyword research passion of mine as well, still provided some neat tricks on how to develop a solid keyword list after generating a bunch of data from a number of different keyword sources. Cyrus took the stage next and delivered an outstanding presentation on the development of “Perfect Pages.” Cyrus defined “Perfect Pages” as “category-defining resources that rank highly for 1000’s of keywords and variations.” There was an impressive amount of solid information around the development of the “perfect page” but one of the primary takeaways from the presentation for me was “Give the user zero excuse to hit the back button.” I will be digging into the development of “Perfect Pages” in another future blog post as this is very important and ties directly into the presentation by Purna and Dr. Pete. 2:45 PM – The last session of the Engage Conference that I attended, prior to the afternoon keynote, was presented by Jon Henshaw and Bill Hartzer. Bill Hartzer talked extensively about his process of performing a technical SEO audit of a website. It was extremely thorough and covered a vast array of aspects to consider when auditing a website. Jon Henshaw, of RavenTools, delivered one of the best presentations, in my opinion, titled: “Make Fast Sites.” Due to the fact that site speed is such a focus from a search engine and user experience stand point, this presentation really resonated with me. You may ask why having a fast site is important and it is simple: Fast sites get more traffic and make more money as well as increase their Google crawl budget which means that the faster your site loads the more pages of your website Google and the other search engines will be able to index. Once again, there are tons great details that I will expand upon in a future blog post, but a couple of highlights on making your website faster are: Don’t use custom fonts or Google fonts, use system fonts and Optimize Images. 4:10 PM – The day closed with a presentation by Cindy Krum, CEO and Founder of MobileMoxie, who provided her insights around Mobile-First Indexing: Rethinking Position Zero. This presentation focused on how content is indexed and how, with the growth of digital assistants such as Amazon Alexa and Google Home, content that was historically in AMP pages, PWAs, Native Apps, and databases can be ranked and surfaced without URLs. Her presentation really closed the gap on why there is a need to create a “Perfect Page” as Cyrus Shepard discussed which, as stated above, tied back to the presentations by Purna and Dr. Pete. 5:15 PM – After Cindy wrapped up her presentation, the Engage Conference staff provided a happy hour gathering with french fries and drinks though I was so full from lunch and breakfast that I couldn’t eat another bite. They also provided an After-Party which I was unable to attend, but heard that it was a pretty impressive gathering from my colleagues who attended. 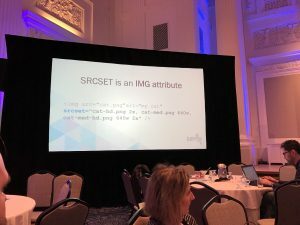 In summary, SEMpdx put on an impressive Conference that allowed attendees to learn from industry leaders in the digital marketing industry. Pair that with the location and the amazing menu, and this is definitely a conference that I will be going to again, and I recommend you attend it as well!